In February 2018, Omenala Press played host to a celebration of Buchi Emecheta in London; launching 6 of 12 imprints of Buchi's books. A day of rekindled memories, healing, story telling and conversations, Niki recounts the event and its reinforcement on the importance of Emecheta's work and life. f you are unfamiliar with Buchi Emecheta’s story, do yourself a favour: pick up any of her books and start reading — immediately, too. A prolific writer, her body of work includes articles, plays, both adult and children books, and an autobiography. Her books, though mostly works of fiction, were inspired by her experiences and those of others around her. Just in her 20s, Buchi found herself being breadwinner, mother, wife, dreamer and goal getter in cold racist Britain. Fearful that a woman could be greater than he imagined, her husband, Sylvester Onwordi, burnt her first manuscript, The Bride Price, in a fit of jealousy. This feeling, which she likened to burning a child, in addition to her deep connection to her Igbo heritage and ancestral hometown of Ibusa, formed Emecheta’s voice — the very voice hundreds gathered to celebrate over eight hours on a wintery Saturday in London. Over the course of an exceptional career, she lectured at Universities around the world, including the United States, United Kingdom and Nigeria - a place she always longed to call home but was never able to. In the 60s and 70s when she began writing, there were but a few Nigerian women, like Flora Nwapa and Zaynab Alkali, being celebrated for this craft. There were even fewer writing as raw and as unapologetically as Emecheta did in all her work. The event, organised by Omenala Press and The Buchi Emecheta Foundation, was held a year after her passing in 2017; primarily to re-launch her classics. To this, the covers of 12 of her 20 books were redesigned by Victor Ehikhamenor, with 6 released in February. Beautifully abstract, undeniably centred in old artistic traditions yet maintaining a newness, these covers are sure to incite the reader to embrace Emecheta’s narratives with a fresh eye. This blend of the old and new is reflective of the work everyone involved in the project sought to achieve — that is, giving young(er) generations access to their history and having the older generation see their legacy honoured. Going by the attendance at the Celebrating Buchi event, this intergenerationality was indeed reflected. For an attendee accompanied by her daughter, re-discovering Emecheta whilst going through a divorce was a saving grace, and an affirmation that she could survive the loss. To hear of such a powerful effect that Emecheta’s work could have on one woman and to also see that her daughter could join such a space was symbolic. 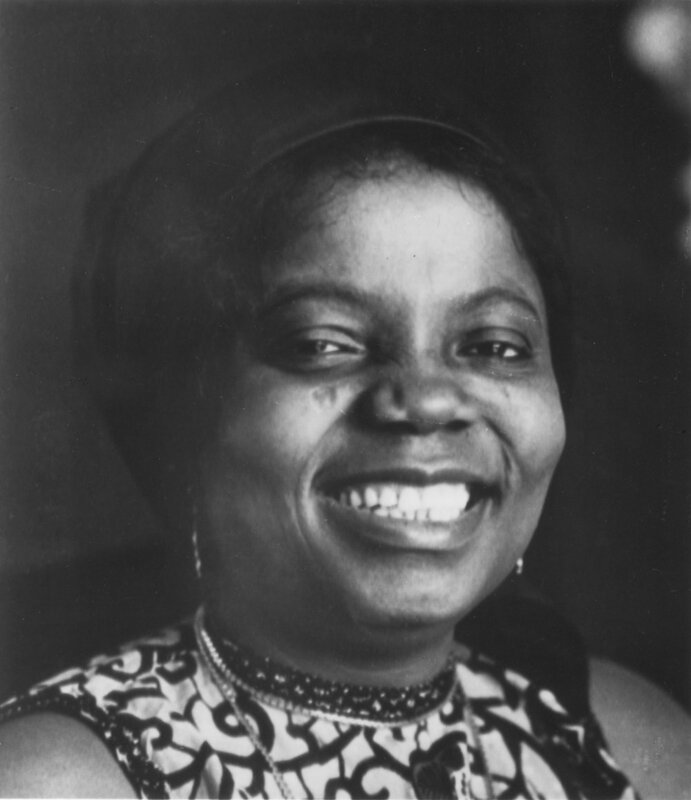 The imprints of Buchi Emecheta’s work come as a result of Omenala Press - an independent publisher established by Buchi’s son, Sylvester Onwordi. Following her passing, he shared, he discovered mounds of unpublished Emecheta work, which inspired a journey that has seen him now wear the title ‘publisher.’ This, one can say, is a full circle journey as Emecheta was also a publisher; setting up Ogwugwu Afor Publishingb for the distribution of her books and others like hers in both Britain and Ibusa, Nigeria. Onwordi’s dedication to his mother’s work contradicts some of the portrayals of the payoff of motherhood in Emecheta’s work. In particular, the ironically named The Joys of Motherhood - her sixth novel which brutally portrays an image of what raising children as a poor woman in a patriarchal society can be like. There was gratitude for Onwordi and the Omenala Press team from both panelists and audience alike. As echoed by an attendee, The Buchi Emecheta Foundation serves as an important first step in ensuring Emecheta’s work becomes as common a place in British Libraries as Shakespeare and Dickens. That Emecheta’s work needs to be included in curricula across as many educational years as possible was stressed by a panelist, who noted a lack of awareness of the author’s work by librarians. This means that for those looking to explore reading outside certain education pathways, the chances of discovering Emecheta’s work are unlikely. The day was broken up into panels, workshops and a gallery exhibitionc - The Legacies of Biafra at the Brunei Gallery. The panelists ranged from academics who have spent time studying her work to individuals who had personal connection to Emecheta. As a reader, it was enthralling to be sat in a room with people who had spent time with Emecheta in both professional and personal capacities. To hear about Buchi - the mother, friend and business woman - was to hear about parts uncovered in her novels. It was beautiful to experience an idol being fleshed out from places of love. Chaired by Delia Jarrett Macauley, one of the panels focused on love and discovery in the work of the author. Panelists linked Emecheta’s work to the personal; family, friendships, marriages and self, emphasising the relatability of Emecheta’s work in the present. The sweetest of all panels, however, was that on legacy and heritage and chaired by Bola Mosuro. The discussions ranged from the disparity in which the wealthy and poor in Nigeria raise their children in Nigeria; to a showcase of Emecheta lecturing across Universities in the United States, and fraternising with beloved African American academics. The Afrikult. workshop provided further insight into how personal and influential Emecheta’s work has been to Black British women. People shared their first encounter with Emecheta’s work; dissecting quotes from certain novels from critical, personal and emotive perspectives. For one woman, reading Emecheta’s biography, Head Above Water, while training to become a social worker in the 80s, changed her approach to her career. She explained that the book made her understand the cultural aspects of the increasing wave of Commonwealth migrants to the UK; giving her a wider perspective that many in her field lacked. Emecheta remains an enigma to me as her books enveloped realities too often brushed under the carpet by the women around me, and the expectations that cripple them. For many women and young girls, alike, these expectations are not contextualised, and a necessary fleshing out of the good and bad parts of meeting these expectations is mostly ignored. Emecheta, in her writing, did stretching. By creating her work and in turn, a space, Buchi spelt out the good and bad; thus determining, long before death, her own legacy. Omenala Press will launch the new reprints in Lagos, Nigeria at the Nigerian International Book Fair on May 9, 2018. Find out more about the event on our What's On segment here. a Read more about Buchi Emecheta here. b In this article, originally written in 1990 and published in print, Emecheta shares with The (New York) Times on why she embarked on the journey of setting up a publishing house. Likewise, in her interwiew with Joyce Boss, Buchi touches on her frustration with Western publishers and her reason for creating her own platform and publishing. c Emecheta's Destination Biafra remains an important contribution to literature on Biafra; thus, the exhibition made a great fit for the event. This is because both stories - Biafra’s and Emecheta’s - are centred around trauma: living with trauma, surviving trauma, experiencing trauma, and what it does to future generations.